Many states of lowered vitality and weight gain are directly related to "stagnancy" of the colon. PhytoLax is an effective and gentle option. PhytoLax can assist with the establishment of regularity, which can then be maintained by proper nutrition and exercise. 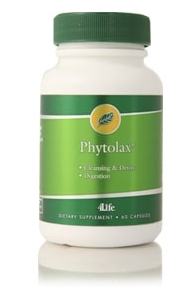 Herbal extracts reactivate under-used muscles of the colon to promote daily elimination. Combined with regular exercise and attention to dietary fiber, you will be able to maintain balance. Regularity can improve general health and well-being and is an important step in any program of self-improvement. "Recently I was an overweight, unhealthy and miserable person. Responding to a contest to lose weight, I tried Fiber System Plus®, Phytolax, Tea4Life™ exercised regularly and changed my eating habits for ten days. I was able to maintain a healthy weight"